What role can Europe play in the domain of AI? Residence Palace (Rue de la Loi 175, Brussels) on Monday 18 February, 17:30-20:30. In the last couple of years, several EU countries as well as the European Commission have been publishing AI strategies, planning new investments in research in the area, facilitating uptake from industry, and looking on how to ensure an inclusive and socially responsible development in AI. Moreover, different stakeholders have called for a specific European approach, different from the market-dominated one of the US and the control-oriented approach of China. The big question remains: what role can/will Europe play in the domain of AI? Redscope Consulting was delighted to be a part of this timely debate organised by the European University Institute’s(EUI) Alumni Association. 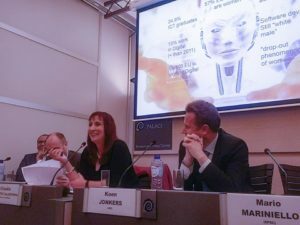 Our own Claudia de Castro Caldeirinha was happy to join the panel of other Alumni to debate the three pillars highlighted by the European Commission’s Communication ‘Artificial Intelligence for Europe’ and its Coordinated Action Plan, together with Host Alessandra Chirico (EUI AA Vice President) and the other Speakers: Mario Mariniello (European Political Strategy Centre), Koen Jonkers (EC’s Joint Research Centre) and Alexandre de Streel (CRIDS/Namur Digital Institute / University of Namur). Claudia focused on digital inclusion, namely for the 50% of the world population who are women. She has based her speech on the latest research and studies, including the “Women in the Digital Age” – issued by EC’s Commissioner M. Gabriel – showing that Europe has four times more men than women in ICT-related studies. This survey shows that fewer women in the EU are interested in participating in the digital sector, be it higher education, jobs or entrepreneurships (in relation to a 2011 study) and that if more women were to enter the digital jobs market, this could create an annual EUR 16 billion GDP boost for the European economy. Elaborating on the trends, challenges and opportunities for an EU people-centred AI and Digital strategy, Claudia stressed: “What the future will hold for all of us – including the 50% of humanity who are women – depends on which policies are done today to bridge the digital divide. (…) What is at stake is not just women’s ability to seize the opportunities offered by the digital revolution, but also its consequences for Europe and for today’s interconnected world economies.